Diamond Plate Metal Pegboards give you both a sleek industrial look and industrial strength. These heavy-duty all metal pegboards are stronger than hardboard or plastic pegboards and can be used indoors or outdoors. The unique diamond pattern gives these pegboards an industrial, modern design. Ideal for storage, organization and display applications. 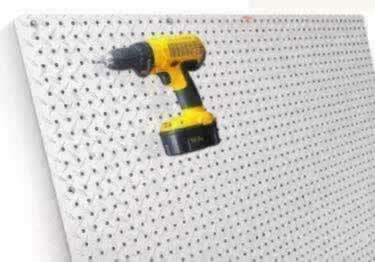 Heavy-Duty Diamond Plate metal pegboards. Comes in a variety of colors. Ideal for garages, restaurants, retail and factories.